Victoria M. Inshetski, 92, of lifelong resident of Jessup died Monday August 13, 2018 at the Allied Hospice Center. She was the widow of Donald F. Inshetski who died on April 25, 1988. Born in Jessup, she was the daughter of the late Andew and Victoria Sislo. Educated in Jessup schools, prior to retirement she was in various local production factories. 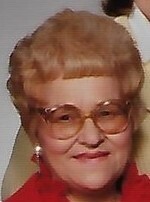 Victoria was enjoyed vacationing in Florida, gardening, and cooking for her family, especially her grandchildren. Her family would like to extend a heartfelt thank you to the entire staff of the Allied Hospice Center for all of their kind and compassionate care. Surviving are daughters JoAnn Inshetski, Jessup, Diane Aiello and husband John, Jessup, Victoria Lepore and husband George, Florida, and Betsy Cerene, Scranton; son Donald Inshetski and wife Marilyn, Scranton; 15 grandchildren; 15 great-grandchildren; several nieces and nephews. She was preceded in death by son Patrick Inshetski; brothers Max, Fred, and Carl Sislo; sisters Mary Kapuschansky, Genevieve Caines, Josephine Kutchmanich, Caroline Siarkiewicz, and Jean Taiariol. The funeral will be conducted Thursday at 9:00 am from the Arthur A. Albini Funeral Home, 1003 Church St., Jessup, with Mass of Christian Burial at 10:00 a.m. in Queen of Angels Parish in St. Michael’s Church, First Avenue, Jessup. Interment St. Thomas Cemetery, Archbald. Friends and family may call Wednesday from 6 to 8 p.m.
To send flowers to the family of Victoria M. Inshetski, please visit our Heartfelt Sympathies Store.